Surrounded by lakes, rivers and cool flowing mountain streams, Eureka Springs top summer attraction is the great outdoors. With activities that range from easy to strenuous, there is an outdoor activity for everyone. Adventure is waiting just outside your door. Find dozens of natural springs, pocket parks, lakes and rivers right in Eureka Springs. Here are some ideas to enjoy your summer in Eureka Springs. Play a round of golf in Holiday Island, just outside Eureka Springs on Hwy. 23 North. Click here for Golf Vacation Deals. Explore the hidden side of Eureka Springs with a tour Downtown-N-Underground. Reserve your tickets for this and other Eureka Springs attractions online. See more great Eureka Springs attractions. Take a self guided walking tour of downtown Eureka Springs where Victorian buildings are nestled into the tree covered hillsides and surrounded by natural stone walls. Learn more about Downtown Eureka Springs. Relax around the pool at Best Western Eureka Inn, at the entrance to Downtown. Jam to some music in Basin Spring Park. Learn about other great Eureka Springs events happening this summer. Cook out on the grill, hang out near the water and even stay overnight in a rustic cabin overlooking beautiful Inspiration Point at Can-U-Canoe. Reserve an exclusive Cottage at Crescent Park and sit out on your private deck overlooking the treetops. See more Eureka Springs cabins. 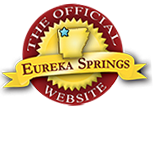 See more Eureka Springs mountaintop resorts, bed and breakfasts, motels and other Eureka Springs lodging. Find great deals on lodging at ReserveEureka.com. Rent a boat from Holiday Island Marina and ski or swim on Table Rock Lake. This entry was posted on May 25, 2017 by service424 in Basin Park Hotel, Crescent Hotel, Fun Downtown, The Great Outdoors, Things to Do and tagged Arkansas, beaver lake, Black Bass Lake, bridges, Buffalo National River, Crystal Bridges Museum, downtown, Eureka Springs, historic downtown, Lake Leatherwood, movies, natural springs, Outdoor, Table Rock Lake, white river.